Sophomore guard Patrick Good had a record-setting night on Saturday when he broke a school record by hitting 11 3-points in a big win versus Western Carolina. Good was hot all night starting the game at an astonishing 9-10 from the 3-point line. He ended up finished 11-of-17 from beyond the arc and 12-of-18 from the field for a total of 35 points. The 35 points was also a career high for Good. Patrick Good broke a nearly 10-year old record which had previously been set by ETSU great Courtney Pigram on Feb. 28, 2009. Pat commented in the post game that he knew he was going to have a huge night early in the 2nd half when hit a contested 3-pointer well beyond the NBA line as the shot clock was winding down. Not only did Patrick Good have a career night but Mladen Armus also had one of the best games of his career. Armus finished with a career-high 21 points (9-of-13 shooting) and grabbed 12 rebounds, while also notching his fourth career double-double. The Bucs started the game hot with a 17-3 lead early on and never really looked back as the Catamounts could only get as close as 9 points the rest of the game. As a team the Bucs shot well at 55% and Good accounted for 11 of the teams 12 3-pointers. ETSU also forced 21 turnovers which they turned into 38 points. Additionally, the Bucs outscored the Catamounts 44-26 in the paint, including seven dunks. 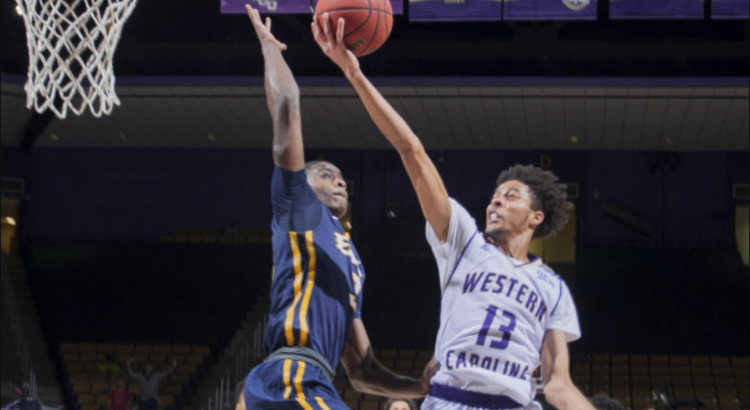 The ETSU dominance over Western Carolina in basketball continued last night as the Bucs have won 24 of their last 25 over Western Carolina. The Bucs also have not lost in Cullowhee since 1998. The Bucs will next face Samford in Birmingham. In a game that projects to be a tough matchup for the Bucs. Last time ETSU faced Samford was a few weeks ago in Freedom Hall when Samford came back from 17-points down in the 2nd half to force overtime but later fell to the Bucs in OT. Samford is also coming off a very impressive two game road swing where they led at Wofford for most of the game but later fell by a point in OT thanks to some late game heroics by Fletcher Magee. Then last night the Bulldogs became the first team all year to defeat Furman in Greenville, with a 75-73 victory over the Paladins. On Saturday night ETSU took down Chattanooga in well played 96-70 victory. Tray Boyd continued where he left off against Samford. Boyd finished with 19 points behind 7-9 shooting, including 4-5 from the 3-point line. The Bucs shot an incredible 61% from the field and 50% from 3 with 9 makes. ETSU also got back on track with their free throw shooting by making 75% of their attempts. 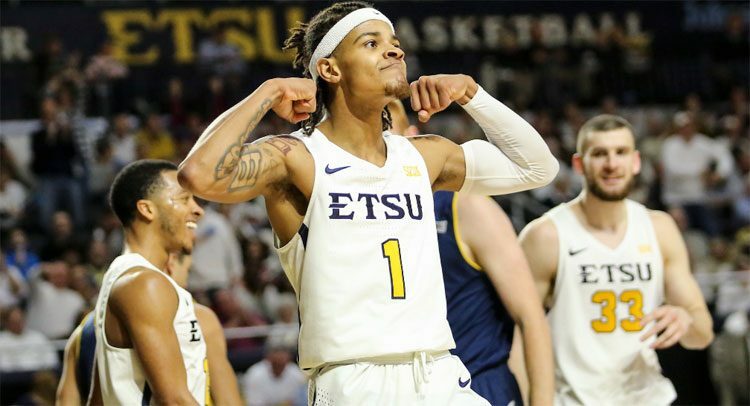 ETSU continued their rebounding dominance by out-rebounding Chattanooga by 10 and that was with their top rebounder Jeromy Rodriguez sitting out most of the first half due to foul trouble. Rodriguez only finished with 4 rebounds for the game, while Lucas N’Guessan and Mladen Armus picked up the slack with 7 and 10 rebounds respectively. The win put ETSU at 13-4 overall, 3-1 in the SoCon. The Bucs have won all nine of their home games, their best start since the 2003-04 season when they went 12-0. It was also the 6th time in a row ETSU has defeated rival Chattanooga. Their average margin of victory during that span has been 17 points. Prior to the start of the game, ETSU legend, Greg Dennis was honored with the retiring of his jersey. Greg Dennis played a huge role in the late 80’s early 90’s dynasty team that went on to win 4 straight Socon titles, a top 10 ranking and NCAA tournament win versus Arizona. Greg is 2nd all-time in scoring and field goals made at ETSU and was 4-time all Socon selection. ETSU next plays at The Citadel on Thursday, January 10th in Charleston where they will look to avenge the loss from last season which prevented ETSU from winning a share of the Socon title. Citadel is 9-4 on the year and lost at Furman today 101 – 85. East Tennessee State defeated Samford on Thursday night 81-72 in overtime after nearly blowing a 17-point 2nd half lead. It was a game of halves on Thursday which saw ETSU dominate the first half and leading by 15 at halftime thanks to tough defense and 5 made 3-point shots. The 2nd half started similarly as ETSU got a quick score by Jeromy Rodriguez and pushed the lead to 17. However, it was downhill for the Bucs afterwards as ETSU missed their next 10 shots. At the 12:39 Samford had cut the ETSU lead to 4 at 53-49. Samford later tied the game at 70 with 1:18 left. ETSU had two opportunities to win the game in the final 38 seconds but neither Tray Boyd or Isiah Tisdale’s shots fell. In overtime the Bucs outscored Samford 11-2 thanks to a big 3-point shot from Tray Boyd and some clutch free throw shooting. Part of the reason for the big comeback from Samford was due to the free throw woes for the Bucs. ETSU missed nine of 15 free throws in regulation but then went 6 for 6 in OT. The Bucs also turned the ball over 18 times. With the win head coach Steve Forbes moves to 6-0 in overtime games while coach at ETSU and half of those overtime victories have been against Samford. The Bucs continued to dominate the boards on Thursday night by out-rebounding Samford 48-31. Both Jeromy Rodriguez and Mladen Armus combined for a total of 36 rebounds. 19 for Rodriguez and 17 for Armus. Coach Forbes even commented in the post game that he had never seen such a dominating rebounding performance from two players in a single game. ETSU continues to lead the nation in rebounding margin at +13.9 a game. Another interesting moment late in the game came when official Karl Hess charged towards Samford coach Scott Padgett during a verbal altercation between the two where Padgett had to be restrained. Padgett later commented in the post game where he said “Are you stepping at me right now?” at Hess. ETSU will next face rival Chattanooga in Freedom Hall at 4PM on Saturday where ETSU legend Greg Dennis will have is jersey retired. After having their 16 game winning streak and undefeated Socon record broken by UNCG on Monday the Bucs were in need of a back bounce win. They got that win with a convincing eleven point victory over Western Carolina. The game was never really in question for ETSU who built an 18 point first half lead and later extended that lead to 23 points in the 2nd half. ETSU got a big boost from Devontavius Payne who scored a game high of 22 points off of 6-7 shooting from the 3-point line. Payne who has been the 6th man for ETSU most of the year got the start over Jalan McCloud who had been feeling ill before the game. 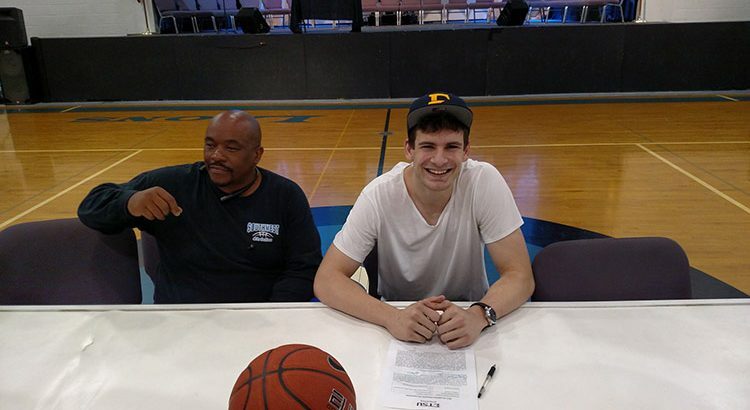 ETSU also got a big boost from the two freshmen, Bo Hodges and Mladen Armus. Hodges scored 17 points in 17 minutes, making 6 of 7 from the field, including a nice alley-opp dunk in the 2nd half. Meanwhile, Mladen Armus was dominating the boards by grabbing a game high 10 rebounds, including 6 offensive ones. As a team ETSU held Western Carolina to just 38% shooting, while ETSU shot 47% from the field and 45% from the 3-point line. The Bucs dominated the boards by grabbing 44 compared to just 24 from WCU. The Bucs also got back to sharing the ball with 16 assists, something they failed to do against UNCG. The only real weak spot from the Bucs in this game was turnovers. The Bucs committed 22 turnovers for the game which is partly why the final margin wasn’t larger than 11 points. ETSU is now finished with road games for the rest of the season, the final three regular season games will be in the friendly confines of Freedom Hall. The Bucs finish the conference road schedule by going 8-1 and have won 11 total road games for the year. That number is tied for the most in all of college basketball. The Bucs have now won 23 of the last 24 games against Western Carolina. ETSU also hasn’t lost a regular season game against WCU since 1998. The last loss came in a Socon tournament quarterfinal game in 2015, which happened to be former coach Murry Bartow’s last game with ETSU. With the win Saturday the Bucs continued to have a hold on first place in the Socon and thanks to a loss from UNCG at Mercer the Bucs now have a 2.5 game lead over UNCG. A win on Tuesday versus The Citadel and the Bucs can atleast clinch a share of the regular season title. However, if the Bucs want to clinch a #1 seed in the Socon Tournament they will need to win at least 2 of those 3 games since UNCG currently has the tiebreaker over ETSU. ETSU will close out the regular season this week with games against The Citadel on Tuesday, Wofford on Friday and Furman on Sunday. All three games will be at Freedom Hall. The Bucs will be looking to clinch the regular season title during this stretch, so come out and Fill Freedom for each game! 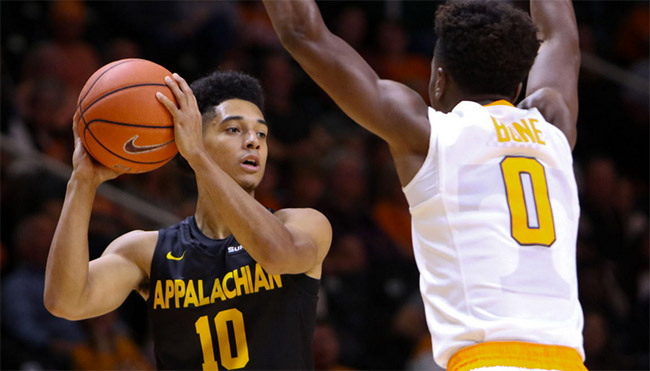 It was announced this morning that former David Crockett basketball star and Appalachian State player, Patrick Good, will be returning to his home in Johnson City to play for ETSU. News Channel sports has learned former Crockett star Patrick Good will join the ETSU basketball program. He will have to sit out a year. As a 6-foot, 162-pound freshman at Appalachian State Good averaged 22 minutes in 29 games. He finished with 7.0 points, 2.3 rebounds and 1.6 steals per game, while shooting 41.7 percent from the floor and 41 percent from three. Good scored 21 points and shot 5-7 from the 3-point line against Tennessee back in November. He also hit seven 3-pointers in a game against Texas-Arlington later in the season. Good also said he attended the ETSU vs UT basketball game in December and loved seeing the enthusiasm from the ETSU crowd in Freedom Hall. He is looking forward to being part of that enthusiasm for the rest of his college career. Good would have to sit out the 2017-18 season per NCAA transfer rules but will have 3 years of eligibility left. Patrick Good will join fellow ETSU newcomers, Kendrick Gray, Andre Edwards, Mladen Armus, Bo Hodges, Jeromy Rodriguez, and James Harrison as part of the 2017-2018 recruiting class. This morning ETSU basketball signed, 6’10 230lbs Mladen Armus, which marks the 4th signing of the 2017-2018 recruiting class. Armus, who comes to ETSU from Serbia, spent his HS career at Southwest Christian Academy in Little Rock, Arkansas, where he helped win an NACA National Championship and was named MVP of the tournament. SW Christian Academy finished 36-3 for the year. While at SW Christian Academy Mladen averaged 16.3 points and 12.8 rebounds, while shooting 60 percent from the field and 73 percent at the free throw line. Before attending Southwest Christian Academy Armus played for the KK Paritzan Junior Team in Serbia. In 2014, Armus helped guide Serbia to a Bronze medal in the U17 World Championship in Dubai, while he has been invited to play in the U20 European Championship this summer. In addition to ETSU, Armus also received heavy interest and offers from Arkansas, St. Louis, South Florida, St. Bonaventure, Fresno State, Washington, Washington State, Creighton and Arkansas Little Rock. 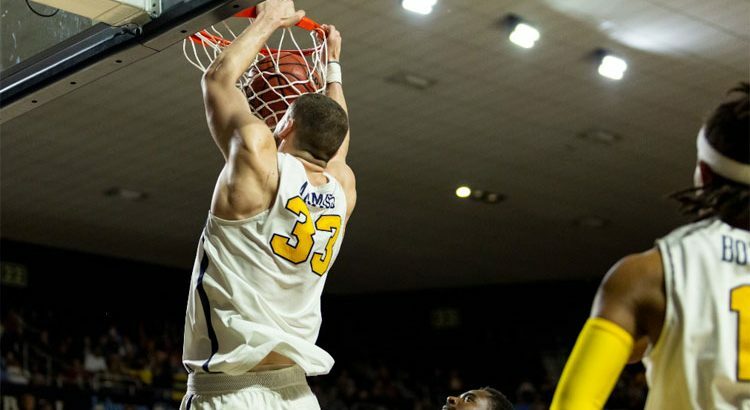 At 6’10 Mladen Armus will fill a big hole at the center position for the upcoming season after ETSU lost both Tevin Glass and Hanner Mosquera-Perea to graduation. Mladen Armus will join fellow ETSU newcomers Bo Hodges, Jeromy Rodriguez, and James Harrison as part of the 2017-2018 recruiting class. There are still two scholarships left to fill for the Bucs. ETSU Hoops will continue to monitor recruiting activity throughout the off-season and will report on any signings or commitments as they happen. My friend, @ForbesETSUhoops just "stole" one. 6-11 Serbian C signing with Mladen Armus signing with Bucs as they reload. ETSU Hoops. All rights reserved. Site design by Eric Franklin.